Our trip across the rest of Missouri and Oklahoma was very nice and uneventful. The weather was warm and clear. The scenery was mostly farms with either flat or rolling fields. In Oklahoma the roads from the Missouri border to just past Oklahoma City are toll roads. It is always fun trying to get close enough to the toll booth to pay the outrageous fare ($8.50 at 2 toll booths and $2 at 2 others), but in Oklahoma City the booths are not manned. You need exact change, as in coins and you throw it in a basket. This can be a problem if you don’t know in advance that you need exact change or how much they are going to charge you for the truck and the trailer. Also the length between toll booths and number of toll booths has no reason to them. From the Missouri border to Tulsa there is only one toll booth, but the much smaller bypass around Oklahoma City had 4 toll booths! We didn’t have any change, nor did their change machine work, for the last unmanned toll booth, so we had to just drive through and will wait for a bill or a ticket in the mail. Our route since we have left the Chicago area has paralleled the famous Route 66. Every town has a Route 66 museum and the main business area is still Route 66. One of the unforgettable features of Route 66 is on the Will Rogers Turnpike near Tulsa. It is a restaurant that spans the highway. Both Kathy and I remember it from family cross country trips in the 60s. I am sure that everyone that past this way as a child remembers it as well. Kathy remembers it as being a Howard Johnson sit down restaurant and I remember it as a more of a cafeteria. No doubt it has changed hands many times over the years, but today it is like all restaurants on the toll road, it is a McDonald’s. 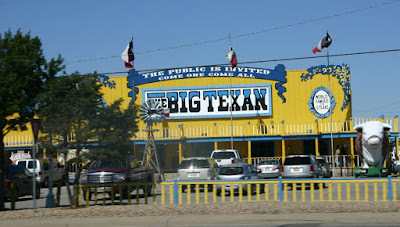 Another unforgettable place on the old Route 66 that is still there is the Big Texan Steakranch. Is has billboards for several states before you get there that they have a free 72 ounce steak. The only catch is you have to eat the entire meal (which also includes a bread roll with butter, potato, ranch beans, shrimp cocktail, and salad) in less than one hour That is a four and half pound steak. Neither of us thought we wanted to give it a try. 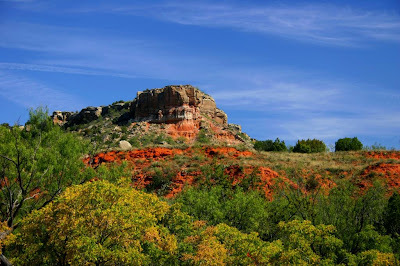 Our objective was Palo Duro Canyon State Park just south of Amarillo, Texas. 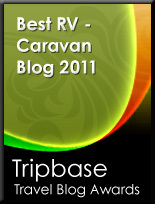 We know several RVers that have stayed there and they all agreed we had to see it. Apparently, we picked a bad time to come. 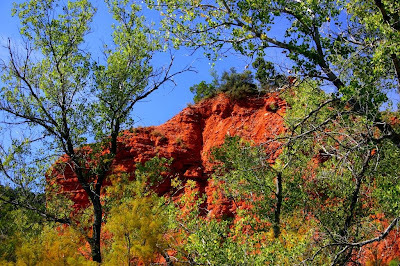 The weekend we arrived Palo Duro Canyon hosted a series of endurance races: 20K, 40K and 50 miles. I may have been dumb enough to run a marathon in my 30’s, but 50 miles on dirt trails in 78 degree heat sounds like too much. 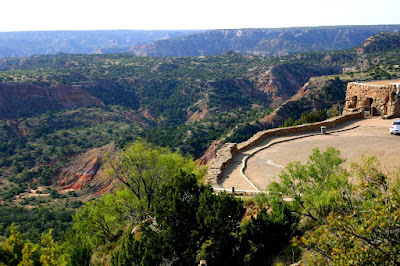 The next weekend they have a Palo Duro Canyon balloon festival: “Pirates of the Canyon Balloon Liftoff”. Their write-up says they had over 1,100 cars come into the park for last year’s balloon event. I am sure it would be pretty exciting to see, however I don't see how they can launch with all of the wind they have. Also the event starts TWO HOURS before sunrise! Sunrise is at 8:02 AM. 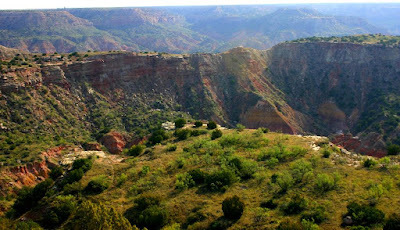 We stayed at an RV park just outside of Canyon, Texas, about 12 miles from Palo Duro Canyon State Park. The first order of business was to get groceries. This is when we came across a new phenomena for us: a “dry county”. We have been to other places where the grocery stores don’t sell beer, but in Canyon, Texas there is no place to buy any kind of alcohol. We found out that there is nowhere to buy liquor in the 112 miles between Amarillo and Lubbock, Texas. We were also told that much of north Texas is like this. This was odd because several parts of Texas have Drive-Through Liquor Stores! One extreme to another! Although we call ourselves the BirdingRVers, about the only birding we have done lately has been on Raider’s walks or as we drive down the highway. 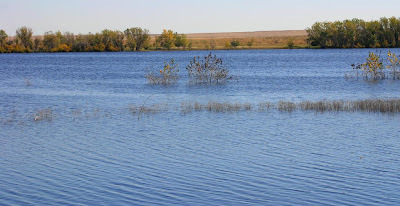 While staying in Canyon we drove a few miles to Buffalo Lake National Wildlife Refuge. Buffalo Lake NWR covers over 7,600 acres, has recorded over 300 bird species and is a major stop for migrating birds. However, the day we were there is was very windy and we saw less than a dozen species. We didn’t add anything to our year list, but it was nice to be out birding. 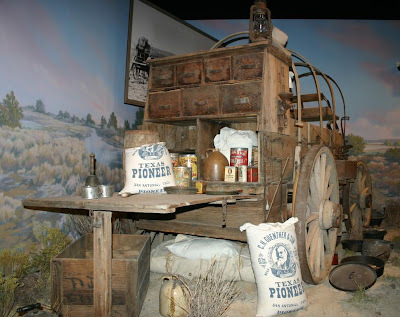 When we checked into the RV Park, the two ladies behind the counter said “you really should go see the museum while you are here”. The very nice lady who had the neighboring RV site said “you really should go see the museum while you are here”. 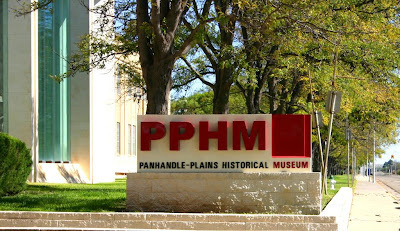 We, of course, said “what museum?” Canyon is home to West Texas A&M and on the corner of their campus they have the Panhandle-Plains Historical Museum the “largest history museum in Texas”. 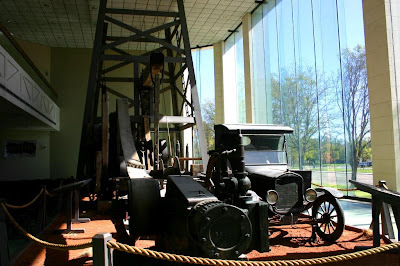 This really is a quite remarkable museum with exhibits that cover pre-Columbian native culture to the history and modern day farming and oil producing methods. We wandered the museum for 3 and ½ hours, by then our legs were giving out. Unlike the Royal Tyrrell Museum back in Drumheller, Alberta, the Panhandle-Plains Historical Museum does not have a food court where you can have lunch and rest for a bit. Finally, on Monday the runners had left Palo Duro Canyon State park and the only ones there were retired people like us. This part of Texas is flat plains. You can see the end of the earth in any direction. 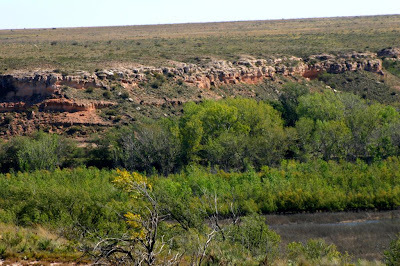 As you drive toward Palo Canyon State Park you suddenly come to a canyon that is 120 miles long and up to 20 miles wide at the widest place. They refer to it as “the Grand Canyon of Texas”. The park does not include the entire canyon but does cover over 26,000 acres of the northern part of the canyon. 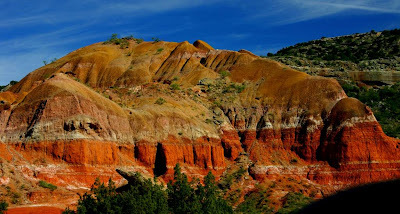 Palo Duro Canyon has a long history of use by Native Americans and in the late 1800’s a ranch supported 100,000 head of cattle. In the 1930’s the Civilian Conservation Corp built the roads and buildings that are still in use today. The canyon provided some protection from the strong winds blowing above the rim. So the weather was warm with a little breeze for the most part. 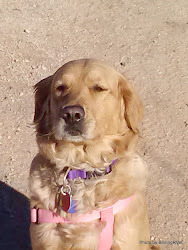 This Texas State Park allows dogs everywhere, except in the buildings, including the trails. We stopped for a little birding, a picnic and for a couple of short walks at some of the turn outs. It may have been due to the wind not being as strong in the canyon, but for some reason this was the birdiest spot we have been for awhile. We saw several bird species including our first Cardinals for quite some time. We added Golden-fronted Woodpecker to our year list, which brings the year list to 241. All of the time we were in the canyon we saw huge formations of Sandhill Cranes flying west, circling and catching the thermals, calling out that prehistoric-sounding call, so they are definitely migrating. We hope their flight takes them to Bosque del Apache in central New Mexico near Socorro, our next destination. It is a National Wildlife Refuge and they have the Festival of the Cranes in the middle of November, to celebrate their arrival. Our next stop was Tire Country in Farwell, Texas to see our friend Lonnie Bussey. We came to Farwell in March to have Lonnie replace our trailer tires before the long trip to Alaska. This time we came back to make sure that we hadn’t broken the springs, axles, etc. on the rough roads. We also had Lonnie replace the tires on the truck. We have driven an unbelievable 20,000 mile since we were at Tire Country in March!